In the town of Vrané nad Vltavou, near a picturesque church, cemetery and parish, just above the river and its paper mill, at the very end of the winding road named V Zítkách, stands a former elementary school. It was saved from decrepitude by a group of local volunteers which later formed the Stará Škola (Old School) association. Thanks to them, the classrooms are once again filled with people, and the community activities aspire to join together three local demographics: the native population, the former employees of the paper mill, and the so-called “city slickers” who come from outside. One Sunday evening, while seated on the staircase next to one of the former classrooms, we talked with Anna Lupienská about how they do things at the Old School. What role does the building of the school itself play in this whole project? The school is about 200 years old, and for a long time it was the only elementary school in the town. About ten years ago, it stopped serving this function. Most of the locals used to attend, or used to walk their children there, so they have a strong connection to it. Did the association’s activities really commence with the municipality’s announcement that they wanted to sell the school building? 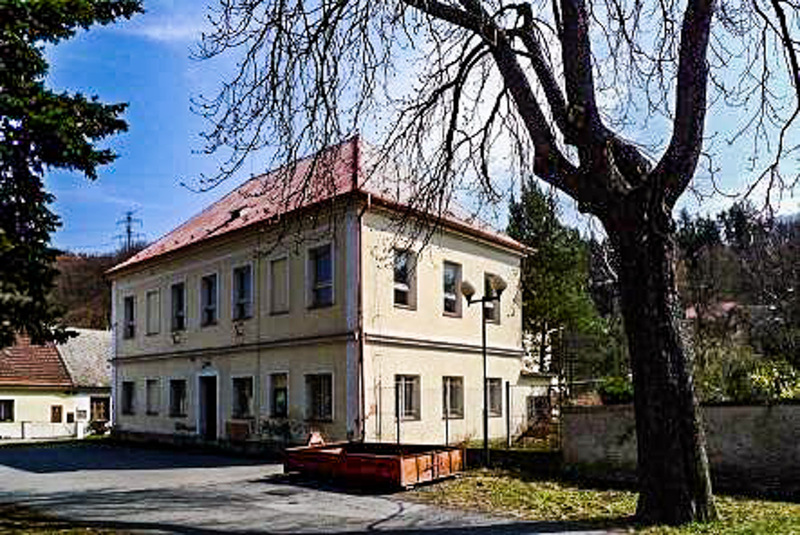 After the school’s closure, the municipality first tried to offer it up for entrepreneurial projects which would serve Vrané’s inhabitants, for example, a caretaking house, but they found no project which would fit the bill. Another possibility was to sell it, and thus get rid of a large part of Vrané’s history. Meanwhile, the building was in worse and worse shape, and so a group of local volunteers decided to keep the flame alive. The lion’s share of this initiative goes to the current director, Pavel Filip, who came to the project with the motto “at least I tried,” and has remained its driving force. Six years ago, there weren’t many people who thought that he would succeed. Initially, he approached some local associations who proceeded to rent out the school’s classrooms for their meetings – Scouts, Military Games, and the U Rybek children’s group were interested. Together they performed the most necessary maintenance, but even so the conditions were pretty bad, and were wholly dependent on the work and the charity of many volunteers and sympathizers. How did the project continue to grow? The café was developed in order to function as a meeting space, and the first benefit event was entitled “Chairs for the Old School,” which managed to furnish the café with donated furniture and cutlery. Then someone got the idea to make the club room into a small gallery and have exhibitions there as well as other cultural programs. At that time, there was also a local sponsor who inquired about ballet classes, and furnished one of the classrooms with a wall of mirrors and handle bars, transforming it into a small gym. And it just snowballed from there. More and more people became interested and came up with ideas which in turn drew more people, and we have been growing like this ever since. At the very beginning, we hosted events for the University of the Third Age, and we eventually started having more and more lectures and workshops. The dance hall (which is what we have been calling the little gym since the very beginning) started to be used by smaller groups for whom the local Sokolovna was too large and impersonal, and now we regularly host yoga classes, oriental dance, infant exercise, fit-ballet, gymnastics, and many other things. In the next phase of development, we decided to gradually cultivate the former school yard which is in a beautiful, calm and safe location and is most fitting for parents with children. We are currently devoting most of our energy to it, and the people’s level of interest in this project has really been unexpected. They are willing to devote much of their time and energy to volunteer work and to organizing garden parties. How did the municipality react to such developments? The municipality was not thrilled about it because they still believed that they could make use of the building in a different manner, but they lacked a concrete plan, and luckily no-one was interested in buying it. And so we were loaned the former school for no rent, although we still had to deal with the expenses for heating (there is an ancient boiler for solid fuels), electricity and all other utilities by ourselves. How strong is the core of the Stará Škola group? The most close-knit group comprises about 6-10 people who regularly meet to discuss the program, the new projects and activities, operational issues, financing, PR, and communication with partners (for example with the municipality), and general coordination. The wider circle comprises dozens of people who are willing to regularly help out with the café’s operations, organizing events, taking part in the volunteer work, or handling a certain aspect of a given project. It is important for both the inner and wider circles to be comprised solely of volunteers, as we have no money to pay wages. How would you characterize the association’s members and sympathizers – do they all share some common quality? The initial stages of the project were carried by the zeal of those people who had some personal connection to the building, so it mostly comprised the long-time natives. Another common feature was shared interest in independent cultural and educational events, and a certain penchant for autonomy from the mainstream. And also there is the ability to disregard numerous imperfections which are balanced by the opportunity to take part in the events, and to exercise some influence over them. Gradually, we started getting attention from people who in fact moved into the town only recently, and were looking for an opportunity to take part in local community life, but did not enjoy the grand events organized by the municipality. These people are now very active members, which may have something to do with the fact that they moved out of the city on purpose, in order to move away from the crowd and become part of a smaller community where they can better help define its character. While developing the Old School, what was your moment of crisis, and how did you manage to overcome it? It was rather a crisis phase which every NGO encounters after those few years of initial growth which are driven by pure enthusiasm. The growth started to get out of hand – we were stretching the limits of our capacity, and we started getting burned out. We learned to plan better, and not actually do all the things we might be interested in doing. And we also managed to organically perform a generational transfer: it started with getting our children involved, who in turn brought their peers, and they took a large load off our shoulders. They also came up with new things which are interesting for their generation. How do you agree on your priorities when moving ahead? We all share similar basic priorities within the team – we want to be a place for meeting, one where everyone can express themselves as they need, both actively and passively. So in this sense, it is not necessary to decide on priorities. Further development is limited by the building’s capacity, the finances and our human resources, meaning volunteers. So we decide on just the minor priorities as part of our regular monthly meetings. The dramaturgy of your events is quite broad: from educational events for seniors to children’s art workshops and literary readings. What is the template for designing the Old School’s dramaturgy? Our dramaturgy is based on culture and education, and is selected for our café’s Sunday program. Each person on the team can come up with an idea for an event, whether it is their own or inspired by the broader circle of our fans. The condition is that he or she becomes the program’s supervisor and manages its production. The program is agreed upon for each quarter of the year, and we fix the dates during our monthly meetings. Then there are the various lecture cycles, as well as other regular events which are the responsibility of a specific team member who manages their content on his or her own. This includes the University of the Third Age, Memory Training, art courses and studios, etc. What responsibilities do you personally have? I take care of fundraising, coordinating the Sunday program and the café’s Sunday operations. I devote about one day a week to the Old School, but I do not consider it to be work. The combination of pragmatic employment and culture, which is more a hobby I can pursue freely and without financial pressure, is the ideal combination for me. Why do you do it and what do you get in return from your work with the Old School? It gives me a sense of safety, knowing that I am among people with whom we largely share the same priorities, and also gives me the opportunity to work on a project I believe in. I have always worked in the financial and accounting sphere, but I also always sought out culture, literature and art. And because I am personally not very artistically talented, I try to at least support others who are, and so I get something in return as well. My second motivation is that I have been living here for almost thirty years; I like it here, and I am interested in the people of Vrané. Being among them and experiencing something together is much better than sitting at home. I enjoy the events I coordinate, and if someone else also gets something from it, then so much the better. And that is almost always the case, regardless of whether there are five or fifty people present at any given event. This gives me energy to pursue the things which might not be as rewarding, like writing up grant applications. What event from the past one or two years are you most proud of? What was your biggest achievement? We have gotten to the point when it is hard to rank individual events. We have larger projects, such as rejuvenating the garden. We are thus able to have beautiful garden parties with accordion music, a bonfire and grill, sitting on the grass, a sandbox for the children, and so on. But on such a scale, drafting the program becomes a team effort, and I am very happy that there are more and more people joining us. And what are you looking forward to doing this year? The main event of the year will certainly be the benefit which will take place on May 26th, and which will be connected with celebrating the building’s 200th birthday. That will be our garden mega-party, as there will be perhaps 500 people. Organizing it with such a small team is certainly a challenge – you need food stands, catering, 3-4 bands, children’s theater – but we always have a blast doing it. The aim is to raise money for renovating the building or garden (we are, for example, choosing a new floor for the café this year). But, first and foremost, we want to offer a pleasant afternoon for all those people who have been supporting us throughout the years. What is the association’s financing structure? Do you seek grants from public sources, or are you rather focused on private donors, or are you most dependent on the donors and supporters from your own ranks? The necessary utilities expenses are covered by the rents we receive from the building’s users – the children’s group, clubs, dance hall events... We receive a subsidy from the municipality which covers our expenses for heating. The café and its program must pay for itself and for its minor operational expenses. The work is 100% done by volunteers, and we start doing the new projects when we manage to acquire grants for them. The improvement of the building and the garden is financed by donations – both financial and material – from our supporters. We furthermore occasionally manage to acquire some grant: we repaired the toilets and showers with the resources received from one of them, while another one was used for rejuvenating the garden. Artists are sometimes also our sponsors, and they often perform here without any honorarium. Artists sometimes donate their art works, and all the money received goes wholly into the operations, the minor investments into the building, and its necessary maintenance. Nobody gets paid for their work here. How many people are involved with the center, and how much time does it take up? We do not pay ourselves at all. Personally, taking care of the Old School takes me about one day a week. I am lucky enough to have a job where I do not have to come in every day, so I can arrange my schedule as I see fit. Otherwise, it would not be manageable. The core team consists of five people, we have no hierarchy, but only various responsibilities. I am responsible for the cultural program and the café’s operations, and I apply for grants wherever I can. Pavel Filip is responsible for the building’s operation which, considering its age, is quite a lot of work. We still have the original coal boiler and we are constantly experiencing some technical mishaps. Majka Filipová organizes the exhibitions and other artistic events, Filip Ditrich is responsible for the formal aspects of our operations and occasionally organizes some exhibitions. And Dáša Andělová is responsible for the events for seniors and children, takes care of accounting and, along with her daughter, bakes delicacies for the café and organizes workshops. Apart from this, everyone helps out wherever necessary. Is it hard to stay afloat financially? It is very hard. It occasionally happens that some people from the team pay the bills from their own pockets for a while, at least until the next grant or subsidy comes in. We really do survive only because of our team’s loyalty and devotion. Can one even plan ahead while in such financial insecurity, never being sure what the next year will bring? We must have the basic financial balance figured out beforehand, and we usually start working on projects only when we are confident that we can finance them. Sometimes it is also the other way around, and that makes for great motivation to get the money, no matter the cost. [Laughs.] Financial insecurity is not the worst; the worst thing is that the municipality each time only prolongs our lease for a year. So each year, at least until late October, we are never sure whether we will be able to use the building next year or whether we will be evicted. It seems so far we haven’t sufficiently proven that our activities have value for the inhabitants, as the municipality is still considering whether there aren’t better ways to make use of the building. It seems that you have managed to build an interesting community in Vrané around the Old School. Why do you think that similar projects elsewhere flounder? Although nowadays it is mostly about the community rather than about the building itself, the school’s genius loci was the original ferment on which we built the rest. Apart from that, I think we managed to spread enthusiasm while doing good work, which in turn enthused other people. Since the very beginning, we had also tried to integrate diverse groups into our program – University of the Third Age, dancers, Scouts. And we also seem to have filled a gap, as there was a marked absence of a similar community in our town. Is it possible to transfer your experience to other milieux? Or, put another way, what is key in building similar communities? It is very important to remain open to various groups and ideas, otherwise you are not building a community, but a highly profiled group. That doesn’t have to be a problem in and of itself, and it can even bring a high level of quality within that limited spectrum, but it is no longer a community project. On the other hand, we also need some boundaries – we don’t, for example, cater to any commercial events, and leave sports activities to other associations. What associations from your locale do you cooperate with? We are in contact with many. Usually, they are associations which work in the field of culture or education, not only in Vrané, but also in Prague and its surroundings. In Vrané, we used to have great relations with the Perla gallery of Ivan Mečl, but unfortunately they are no longer operating in the spaces of the former paper mill. How is life in Vrané influenced by its close proximity to Prague? It is a bit unfortunate that Prague provides many opportunities, and thus it sometimes draws away our potential audience. On the other hand, it is a fact that realizing cultural and other events in close proximity to Prague is easier, as our performers don’t need to travel a long distance to get to us, and they enjoy coming. Where do you see the Old School in five years? The vision for the Old School is to continue to be a place for meeting, one where people will feel good, and feel free to follow their interests. As I said, our further development is limited by the building’s capacity and our human resources. We would like to continue improving the building and the garden, as they really deserve the care we give them. If we found the right grant, we in fact have a study for the building’s renovation already worked out. And in five years, we hope to remain a platform for activities which our residents will find interesting. What would allow you to achieve such a goal? We would like to win the trust and favor of the municipality, so that they would provide stability for us. We would like to become more effective in our work, and it would also be great to gain the resources to pay out at least symbolic rewards for our team – both to the inner and the wider circle. It would be ideal if we could afford at least one employee, as coordination and the activities themselves are enough for a few part-time jobs. We love doing it, and we would like to be able to continue in that. We will see whether the municipality’s representatives will prolong our contract. We would like to remain here, as the school and its genius loci is ideal for a community center. What do you think are the biggest risks for the Old School’s further development? key members of the team. How will you make use of the Agosto Foundation’s grant? The grant from the Agosto Foundation helped us tremendously with our strained cash-flow. We invested most of the money into the garden, and the rest was distributed to cover the backlog of operational and program costs.